The veteran BBC TV composer and arranger Ronnie Hazlehurst died on Monday night. His long career at the corporation produced some of the most (irritatingly) memorable theme tunes: including The Two Ronnies, Reggie Perrin, Last Of The Summer Wine, Blankety Blank and the Morse Code theme for Some Mothers Do 'Ave 'Em. But when his obituaries appeared yesterday, there was an odd addition to Hazlehurst's canon. 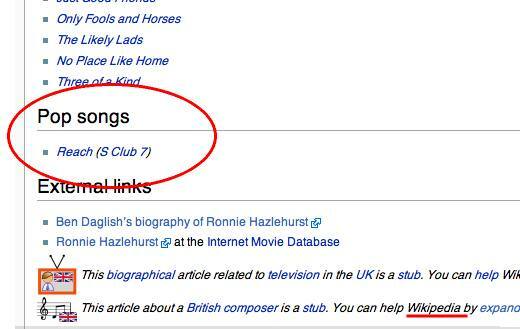 Apparently he had emerged from retirement a few years ago to co-write the song 'Reach', a hit for Simon "Spice Girls" Fuller's creation S Club 7. "There could only be one source for this," suggests Shaun Rolph, who tipped us off. 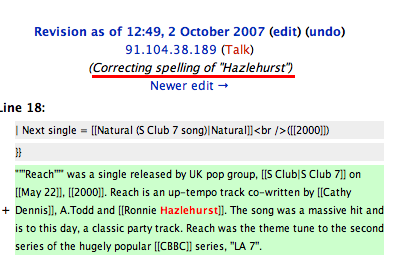 A couple of seconds in Google takes you to a real, primary source, EMI Publishing, where the correct credit for 'Reach' is hidden in plain view: Cathy Dennis and Andrew Todd. The MCPS confirmed to us that the royalties are split 50:50 between the two composers. So who fell for this? Step forward BBC News, the Grauniad 2.0, the Independent, the Times, The Stage and Reuters - who all cut and pasted the phoney factoid from Wikipedia without a second thought. The Times' obituary writer professed to be surprised by Ronnie's late-career comeback - but not so surprised he felt the need to check. Hats off to the Telegraph, however, for not supping from the poison cup of Web 2.0. Recently, Tom Melly wrote here about how lazy hacks could look no further than Wikipedia for biographical information about his late father George - and rightly put the blame for the spread of misinformation on the journalists themselves. But this is the first case of obituarists being hoaxed in such large numbers. It's as well Wikipedia hasn't branched out into the Funerals and Tombstones business. With fantastic timing, the Guardian Arts blog asked yesterday, "Could the birth of literary software herald the rise of robotic authors?". Er... they're working on it, folks - starting with robotic reporters.